It's been a while since I wanted to write this post. Being a Spanish developer means I have to build multilanguage sites. 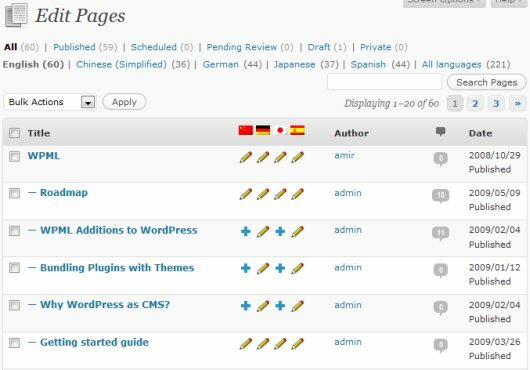 Using WordPress it's not that simple. I started using the plugin qTranslate. The problem with this plugin is that you can not set diferent post URL for each lenguage. 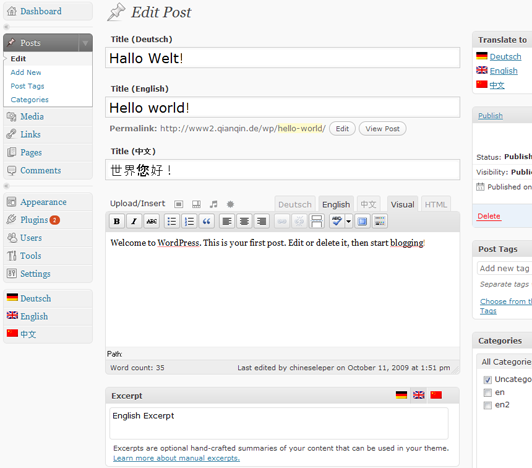 Then I came across with this great plugin WPML Multilingual CMS. It's just the best. You can set diferent post URL for each site what means better SEO. Working with the admin panel it's pretty simple, all config are easy to set up. If you're working on a theme and you want to set some hard-core text or links they have a full documentation here. Even this part is really simple. I use WPML in one of my blogs and it’s awesome. It even has a professional service for translating your content and comments which may be very useful, but it’s very expensive. I like it a lot and I recommend it, it works with most plugins. 4.787.572 post views so far. This page needed 42 queries to load.